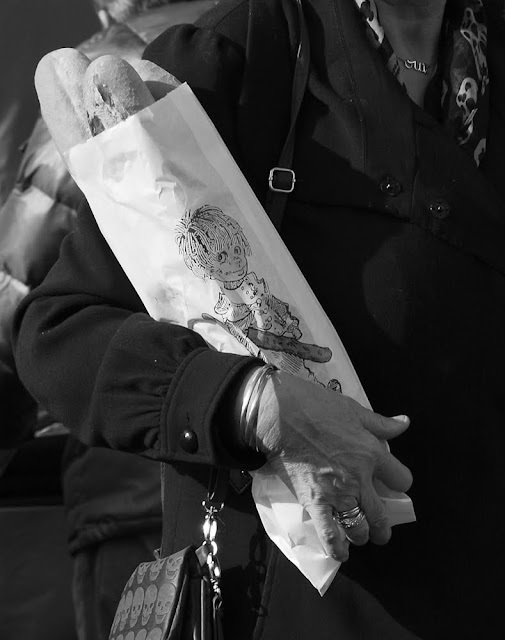 Oh, so good...the baguette AND the photo, especially the bw one. When I lived in France, you didn't get a bag; just a piece of paper. Bibi, if you buy just one, you get a piece of paper wrapped around the middle, but it seems if you buy several, you get a bag! Any snow last night, Jilly? Apparently there was some in the Var? Nothing here, just a biting cold mistral and bright blue skies. Three baguettes -- she was preparing for the storm, perhaps. I wish I had a nice warm baguette right now..
Love the bread, love the bag. Great shot. I miss French baguettes. Not many places here have perfected them! A thing known as french all over the world, and so usual for us! Would have to buy several to receive that cute bag. Quintessential French! I was devastated when I found my boulangerie at the foot of the Rue Longue had been turned into a snack shop. My back-up bakery was gone as well. So sad for the old end of Menton. Rick, well spotted. They are strange, aren't they?! Karen, yes I agree. Now the nearest, I suppose would be the market (where there are several boulangeries) or walking a little further to the shop in the next square.